With The Brandery soon taking applications for their 2014 class, I’ve been thinking back on my experience at the Cincinnati-based accelerator. Our company was lucky enough to be one of ten companies selected out of over 1,000 applicants to participate in the 2013 class. While many Nibletz readers are familiar with the Brandery, I’m sure a large portion of startup enthusiasts have still never heard of it. Because after all – who has ever heard of an accelerator not located in SF or NYC named something other than TechStars? The Brandery may not come from the same pedigree as the aforementioned, but it makes up for what the big guys lack in special ways. In fact CNN just named it to their top 9 hot startup accelerator list for its strength in consumer branding. With it’s proximity to Proctor & Gamble, (the same company who outpaced every other in the world with over $5 billion in ad spend in 2012) people in Cincinnati know how to market. Every Brandery company receives $20K in exchange for 6% warrants, pro-bono work from some of the top digital and marketing agencies in the US, and a mentorship list that could compete with many of the top accelerators in the nation. The strong consumer marketing curriculum every Brandery company undergoes is built on the back of those mentors and professionals. Often unmentioned but one of the most important facets of being in the Brandery is you find yourself being supported by the entire city of Cincinnati. People take their home very seriously in Cincinnati, and you’ll find most residents and businesses are willing to lend a hand to your cause no matter where you’re from. short conclusion on what happens to companies post “accelerating”. Let me start by mentioning a couple things upfront about my co-founders and I. None of us have technical backgrounds. In fact we had already struck out with one developer, before having to bring in a brand new CTO a week before the program began. While we had experience in business related fields, primarily accounting and consulting, we were very green in the tech world. We had almost no startup experience save for one small business we had started the year before. Oh and did I mention our idea was B2B? Were we ideal Brandery candidates? Not exactly. You need to accept the reality you will not always be moving as fast possible. Many times too much speed will be detrimental to your cause. One of the founders told me months afterward he thought our company came in as a huge underdog. Fact is, we knew it. So we tried to make hurried decisions, hop in other team members’ work, and force our CTO to code as fast as possible. The result? A train wreck. The relationship with our developer was becoming more awkward by the day and we were making each other furious by constantly stepping on one another’s toes. My advice for this misconception is find the right dynamic for you and your team. Find out where your strengths lie and divvy up tasks and responsibilities accordingly. Only step on the gas when you’re sure you’ve made the right decision, otherwise you’re destined to tailspin. Misconception #2: Listen to all the advice you receive. This is absolutely one of the hardest things to do in an accelerator because you’re getting an opinion every minute. During times when you’re taking a break, you’re probably giving a few of your own. You must take every piece of advice with a grain of salt. Trying to action every piece of advice or feedback will certainly make your head spin and almost assuredly result in the quick death of your company. So uh – which is it? The fact is, you’ll have to figure it out for yourself. Hear everything, listen and internalize about 20% of that, and ALWAYS make your own decisions based on what you believe to be the best information at hand. The answer to this will largely depend on how much work you’ve done on your idea before entering said accelerator. But for the vast majority of us, we were primarily in the idea stage and only had minimal prototypes at hand. My take here is to focus on your customers first, then focus on building the product. Grab a copy of Running Lean and read about the right way to do customer problem and subsequently, solution interviews. Future-self will thank you. A good product comes from great feedback and when in doubt, traction trumps a full prototype. This is especially true in the case of non-dev founders. Don’t waste your developer’s time on stuff you may not even know is necessary. His/her time is more important than yours, so treat it like gold. I get asked all the time how to start a company or raise VC funding without knowing how to code. Honestly, obtain customers and the rest will fall into place. We found 100 accounting firms to signup for our product with only a keynote presentation and without a single line of code. So read up on UX/UI and download the Keynotopia plug-in for Keynote. Need some more advice? My good friend and fellow Brandery alum, Nick Cromydas recently wrote a nice post on this same topic. Now that some of those items are out of the way, let’s talk about some things that went well the first month of The Brandery. The Brandery curriculum is front-loaded with amazing advice given by some of the top consumer marketing professionals in the world on almost a daily basis. In fact there are so many presentations that after a while they almost blend together. Despite this I’d encourage others to listen closely and be rigorous in your note-taking. You’ll never know when you need to go back for that one special nugget of advice. With its strong cast of mentors from all over the US, it’s advisable to take advantage early on. Chat with them, ask questions, and overall don’t be afraid to ask anyone involved with the Brandery for something. The worst that can happen is they’ll say no. A word you hear very little of from all Brandery co-founders, mentors, and business people in Cincinnati. Brand-in-a-day is an event that occurs within the first month of the program as well. Each company is paired with a marketing agency in Cincinnati ranging from uber small to some of the largest in the world. The day is intended to allow each company to work with seasoned marketing professionals in order to come up with a foundational marketing strategy. This could mean a name or logo change, a brand manifesto, or in our case, a complete overhaul and slight change in product vision. It’s up to each company to take advantage of the opportunity and work with these agencies for the duration of the program. While some companies received only a few thousand dollars worth of pro-bono work, I’d guess others received work valued at almost 10x that. That value can prove to be huge for early-stage companies and something that definitely sets the Brandery apart from other accelerators. Because the Brandery’s location is Cincinnati, it’s affordable for poor startup founders to live a reasonable lifestyle. I’ve read enough horror stories about living in SF & NYC. They’re great cities for binge drinking and potential investor meetings, but I’d have to wait for a Series A to live there. With founders in this past class coming from cities like LA, SF, NYC, Chicago, and Vancouver, I think you’d find all of them thoroughly enjoyed what Cincinnati and specifically OTR had to offer. Each of us were embraced by the city as a whole and that is something we’re all thankful for. 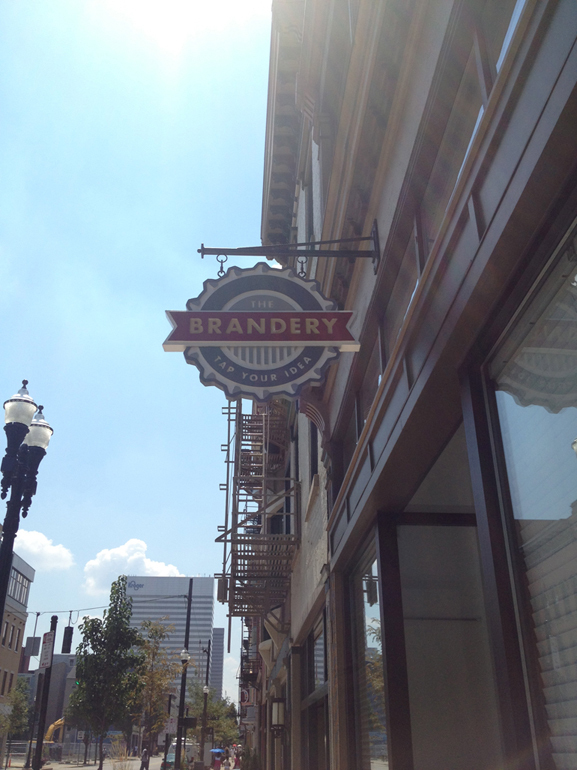 Now that I’ve given you the lowdown on the first month at the Brandery, you’ll have to wait until next post to find out if our team survived, if our developer revolted, and what are the best bars to visit while in OTR? Craig Baldwin is a former accountant turned startup founder. He’s currently the CMO of Cincinnati-based startup Sqrl. Craig’s also a BBQ enthusiast, writer, and purveyor of delicious vintage cocktails. Definitely staying tuned for part 2!